We have been running trips to the Shetland Isles in summer months for the past decade and this beautiful island archipelago is one of the most dramatic and inspiring locations in the British Isles and a great place for wildlife photography. The experience of the Shetlands during the winter months is very different and potentially very special though and our main target for this seasonal visit is the iconic European Otter. These islands support a large population and one of the best times to see them is during the winter months. 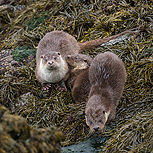 We have teamed up with Shetlands based otter experts Richard Shucksmith and Brydon Thomason and these guys know the local otter population better than anyone as well as how to get us close enough to photograph them. It will be a jam-packed week looking to take full advantage of the settings, subjects and potentially stunning winter light that can be found here at this time of year and with the trip timed to optimise the tides to our advantage and a time of year when family groups are at their most active and potentially approachable too you should achieve both some great images but also experiences with these fantastic mammals too. Day 1: We have a day of travelling to Sumburgh Airport on Mainland (or Lerwick if you have chosen to take the ferry). We will then head to our hotel base towards the north of Mainland where we will be based for the next 5 nights. Days 2-7: Over each of these and the next day we will be splitting into smaller groups of only 2 photographers: each day we will be heading out with local wildlife photographers and absolute otter experts (as their recent book on the species, all photographed locally, will testify) Richard Shucksmith and Brydon Thomason for an exclusive day photographing Otters. It is only possible to do this in very small group sizes, so we have asked them to add their expertise in terms of local families and additional guiding resources to allow us to do this. Day 8: We’ll catch our return flights (or ferry) away from Shetlands accordingly. All transportation on Shetlands, accommodation, meals, and internal island ferries. We have comfortable hotel accommodation. Accommodation is based on twin rooms. Single supplements are potentially available on request. Given the subject and location, all of the photography will by necessity be over uneven rocks along the shore and stalking otters will require some agility and the need to move quickly at times too. Although the days are at their shortest at this time of year here we have timed the trip to optimise the necessary low tides and so will be out for the entire duration of the day with a good amount of walking involved so you need to be of a reasonable level of fitness.